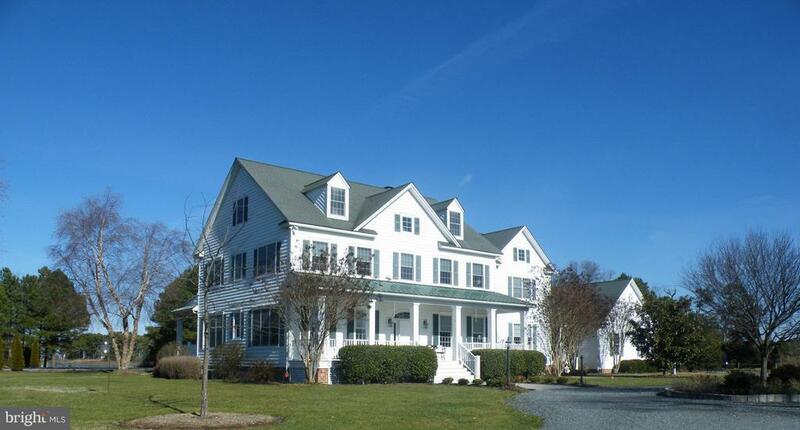 Original Owners - 121.64+/- acre waterfront farm w/excellent hunting on a cove looking out to the Choptank River. The well designed 6 bedroom farmhouse was built in 2002. Perfect for modern living and entertaining, it has 6, 000+/- sq ft of heated living space and sits back overlooking the river and farm fields giving it great privacy. The home boasts 10 ft. ceilings on the 1st floor and 9 ft. ceilings on the 2nd, a spacious master suite with adjoining sitting/exercise room, see-through gas fireplace, wet bar and spectacular master bath with walk-in shower and soaking tub. Double walk-in closets finish off the suite. 3 additional ensuite BRs with walk-in closets. The main floor has beautiful tung oiled pine floors for rich yet casual living . Family room w/wood burning see through fireplace, country kitchen adjoining the magnificent sun room, formal dining room, parlor and office with custom built-ins, walk up 3rd floor floored attic, gunite salt water pool and pier. Theres a 2 BR apartment over the 3 car garage. The house isquipped with a whole house generator. The barn is situated at the front of the property to give the main house its privacy. Perfectly set up for the handyman/sportsman complete with 2 decoy storage rooms, equipment storage and shop, vehicle pull thru for easy access, 5 overhead garage doors. Accomodates 8 hunters, living/kitchenette area with full bathroom. Approximately 80 tillable acres. 2 waterfowl impoundment ponds, and 3 waterfowl pits. According to Owner it has approximately 3, 700 ft of shoreline. Subject to Agricultural Easement. Directions: from Cambridge on Rt. 343 approximately 12 miles to right on Hudson School Rd., Left on Cooks Pt. Rd., barn is on your right and main house is past it on the right at 812.